Become an NWS fan and receive up to date information on our upcoming events. Our July 4th concert will feature 2019 NWS Scholarship award winner, Nestor Pelayo, euphonium, performing The Yellow Rose of Texas. NOTE – We are no longer performing at Chalco Hills. Due to the great success of our past July 4th concerts, we needed to find a venue that provided safer access for our large audience. Be sure to come join us at SumTur Amphitheater and help us celebrate our nation’s Independence Day with a wonderful summer’s evening of music. 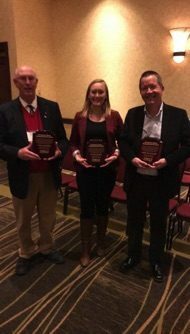 The Nebraska State Bandmasters Association (NSBA) awarded the Duane Johnson Distinguished Service Award to NWS Music Director, Larry MacTaggart in March 2019. This award is given by the NSBA Executive Board to individuals who have helped make “Better Bands for Nebraska”. The award is designated in honor and recognition of Duane E. Johnson and the many invaluable contributions he made to bands of Nebraska. Other 2019 recipients of this award were Tom Jaworski (Retired, Adams Central Public Schools) and Joanie Mathis (Omaha Symphony). NWS is expanding our part-time staff. The concert production manager plays a key part in the operational planning and coordination of each concert. We are accepting applications until April 19, 2019. See our Staff Openings page for the complete job description and details for how to apply. Thank You for Supporting NWS through Omaha Gives! Omaha Gives is on May 22, 2019. Please plan on participating in support of NWS and many other nonprofits in the greater Omaha area. A big Thank You! to the 42 donors who gave $3400 in support of NWS during Omaha Gives 2018. These donations help us to continue to provide affordable concerts of great music to music lovers across the metro area. We hope to see you at any or all of our upcoming events. 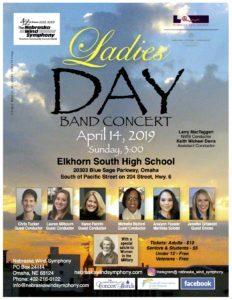 Hey Nebraska Wind Symphony Fans! For information on all of our concerts see our 2018-2019 Concert Season page. Don’t miss another exciting concert! Become a fan and receive information and reminders about our upcoming events. 2019 application period has ended. Congratulations to Nestor Pelayo, euphonium, for being selected the 2019 scholarship winner! Nestor will perform his solo work, The Yellow Rose of Texas, at our July 4th concert. Visit our scholarship page for additional details. NWS relies on financial support from its playing members, concert patrons, and businesses and individuals from around the Omaha metropolitan area. These gifts help us to pay for rehearsal and concert space, music director and other staff salaries, new music purchase and rental, performance rights, insurance, replacement equipment, and so many other things.